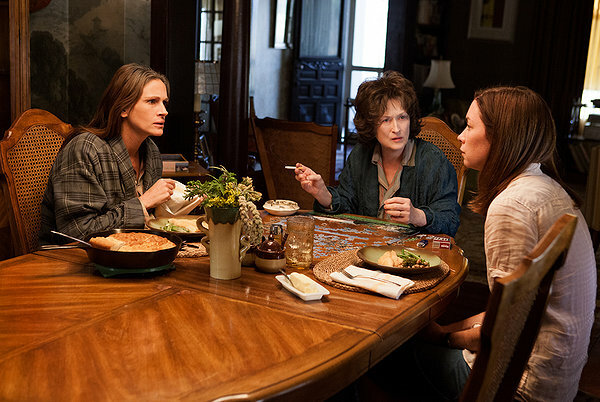 In some ways, watching “August: Osage County” is almost akin to attending a real life family reunion. You are surrounded by a bunch of colorful people who don't normally hang out together. They talk, argue, and sometimes scream over seemingly perfunctory things. By the time dinner is over all you really want to do is take a nap because of how tiring the whole experience was. This is pretty much the film in a nutshell. The film takes a lot of talented people that serious movie goers probably see as extended family members, puts them in a box, and shakes the box for the sole purpose of watching these people scramble. Why anyone thought movie audiences would want to sit through this is a question I've been wrestling with. 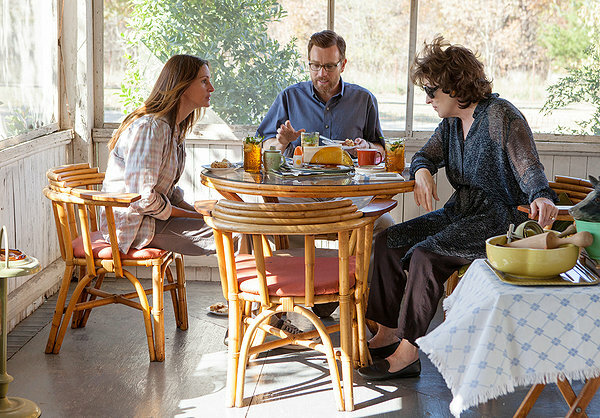 The story that brings all the characters together in “August: Osage County” is the sudden disappearance (and later funeral) of Beverly Weston (Sam Shepard), a man of few words but lots of wisdom. He is a loyal father and husband, so when he disappears it's no wonder all his daughters, nephews, nieces, best friends, and granddaughter all show up to his funeral. Heck, one of his former son-in-laws even shows up to pay his respects and he hasn't even been a real member of the family for a while by this point. The problem is that you have a bunch of people with their own personal problems with the family in general, so when they all come together the results are pleasant. Their talking turns into ranting, their ranting turns into screaming, and the screaming turns into physical violence. Most of the time these characters seem to be fighting about nothing in particular. This is one of those films where characters are given lots of dialog to spout out passionately, yet very little is actually said when you get right down to it. The two women that are the biggest problems is Beverly's widow Violet (Meryl Streep) and his daughter Barbara (Julia Roberts), who are both women of strong voices and stubborn personalities. Violet seems to be the worst however, as she brings up dirty secrets and hurls insults at everyone as if she was looking for a fight. When chided for saying the things she does her defense is “I'm just telling the truth. Some people are antagonized by the truth.” She sort of reminds me a little of my grandma, who in her later years tended to bring up old wounds in order to win an argument she might have been having (usually with my Aunt Mary). Does any of this make these characters interesting to listen to? Let me put it this way: If it were my money going into production, I'd like to see this high caliber talent I was paying do something other than scream and be unpleasant to watch. 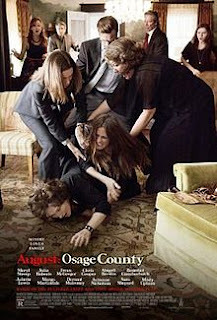 “August: Osage County” is actually based off a Pulitzer winning Broadway play that was very successful. That, right there, might be part of the problem. Over the top acting and screaming works in theater because the cast needs to involve the entire audience in their story. This is why subtly doesn't work on stage. The problem is that with this film adaptation you are practically sitting right next to these people and are in the midst of their fights. The fights are therefor extremely hostile to the audience and there's not much room to breath. 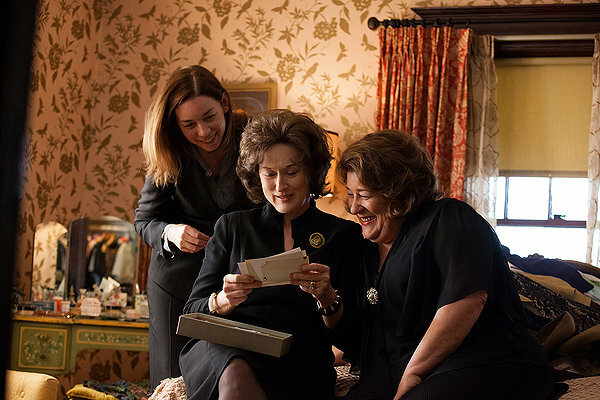 Early reviews from film festivals praised the acting of this movie, particularly from Streep and Roberts, who many believed to have the showiest parts. Yes, Streep and Roberts do a lot of screaming in this movie. Does that make their acting here good? I don't think so. If someone watches these performances and say they are emotionally touched by them I think they might want to dig a little deeper inside themselves. 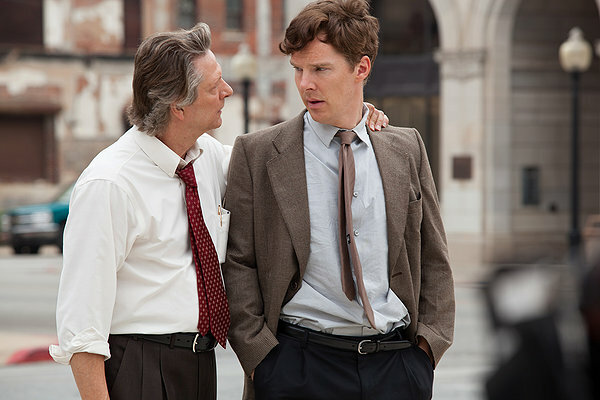 I don't believe these performances are emotionally touching so much as they are draining. Because it's just so exhausting to watch these people after a while, and the movie just keeps dragging everything out with more and more bad news that is thrust upon the viewer rather than explained organically. For some the emotions might give them an inkling they are watching a good movie. Nothing else will be discussed though, as there is no beef to the story (a line that is, ironically, spoken in this very film). Parents, there is very strong language and some drug use. Recommended for ages 18 and up.